Amazing Crime Strange Stickman Rope Vice Vegas is another fun game from the Vice Vegas series. In this particular title, you control a huge stickman character. And you must move through the streets and try to bring to justice the gangsters and criminals and roam the streets. You take the role of the city’s hero, and you can use a variety of different abilities. Such as rope shooting and even a spectacular laser beam from your eyes! You can take control of various vehicles too on the road if you wish and buy weapons to help in your quest to clean up the streets. 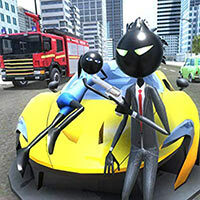 Enjoy and have fun in playing Amazing Crime Strange Stickman Game. Good luck. Also make sure to check out Super Crime Steel War Hero Game and Amazing Strange Rope Police Game. You may enjoy playing them. WASD or arrow keys: move. T: open nearby garage. Q: rope. Right click: laser. Left click: shoot or punch. Space bar: jump. Left shift: run. X: switch weapon. F: open car. R: open nearby shop. G: grenade. Z: switch grenade. C: switch vehicle camera.